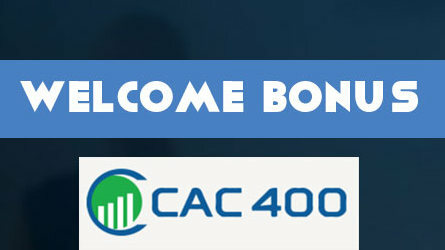 CAC400 is forex broker which offer welcome deposit for new client’s first deposit. The size of the bonus depends of what will be clients deposit. CAC400 is forex broker (See Top Brokers here) which offer three account types – Silver (minimum deposit $200), Gold (minimum deposit $5000) and Platinum (minimum deposit $20,000). The maximum leverage for Silver account is 1:200. They offers webinars & video lessons for everyone. They have all time live chat support and will ask to any question. Withdrawal requirements: Need to meet the trading volume to withdraw Bonus. Register new real trading account in CAC400 and verify your account, as you must send documents for account verification. After verification you must deposit money in your account. The bonus depends on size of your deposit, so if you deposit minimum $250, your account will be Silver and you will receive 40% bonus. If you deposit minimum $5000, you will receive 60% bonus and your account will be Gold. If you want your account to be Platinum and to receive 100% bonus, you must deposit minimum $20,000. This Promotion is valid for all new clients. If clients want to withdraw the bonus, he need meet the trading volume to withdraw Bonus. Please contact with their support for more information about the trading volumes and terms. The promotion could be reject at any time.